Each summer, in preparation for the start of autumn quarter, Information Services updates software on classroom and lab Macs and PCs. These changes consist of general updates, security patches, and, if applicable, version updates. Details of these updates are available on the Information Services website here. For the 2018-2019 academic year, computer classrooms and labs will use Windows 10 and Office 2016, and macOS High Sierra. Team up with friends or fellow developers to enter your world-changing software innovations to the U.S. Imagine Cup – a global student technology competition presented by Microsoft. U.S. finalists can win up to $6,000, startup and technology mentorship, and the chance to advance to the Imagine Cup global finals, where one team will be selected to win $100,000 for our 15th Imagine Cup anniversary. All technology projects are welcome this year – the competition is no longer bound by categories. Get the official Imagine Cup rules here. Quick sign up and next steps! Brief explanation of your idea in video (2 min) or in writing (250 words or less). Open only to students who are legal residents of the 50 United States + DC, 16+ who are actively enrolled at a US school that grants high school or college/university degrees. Round 1 winter deadline is 12/20/16 at 11:59 pm PT. For full details, see Official rules and regulations. Find out more! Questions? Email us at icus@microsoft.com or visit imaginecup.com/usa. Still looking for inspiration? Check out the 2016 U.S. Imagine Cup Finalists and World Imagine Cup Winners. Software Secure will be releasing RPNow Version 2.0 (Remote Proctor Now) on Wednesday, July 22nd. A new recording and video upload process: The software will “Store-and-forward” the video records on the student’s local machine. The files will be uploaded while the user is in the exam, and a pop-up will occur after the software is closed if more time is needed to complete the upload of the video. This method is more robust and allows the option to lower the bandwidth requirement for the system check allowing access to RPNow for users that may not have been able to in the past. 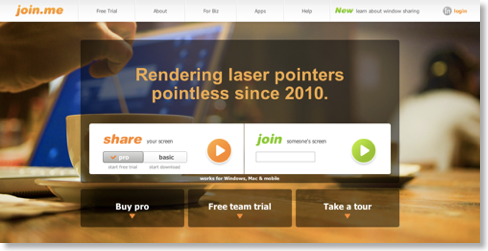 PC Only: The Browser rendering engine Internet Explorer has been replaced with a “chrome” based version. Chrome isn’t required to be installed on the PC. This will eliminate Software Secure's dependency on what is preinstalled on the user’s computer and eliminate rendering issues that are becoming more common due to updates to exam delivery systems. The interview process had been updated with a more modern look and feel. A “Room Scan” review step has been included which now provides end-users/students a review of their Room Scan video before progressing onto other steps. MAC Only: Updated with the new interview process explained in number 3 above. Windows 10 support. The current version doesn’t support Windows 10. NOTE: Support for Windows XP and Mac 10.6.x and 10.7.x will end once the new version has been released. The reverify update is now available. This allows students that are flagged for not providing an ID or providing an unverifiable ID to have another attempt to submit prior to being reported. Over the weekend, I was contacted by Yuriy, the CTO for Icecream Apps. Icecream Apps is a new team of developers that publish freeware (free software) for Microsoft Windows and Apple OS X.
I have not tested the software yet, but there is plenty for faculty and students to look at. 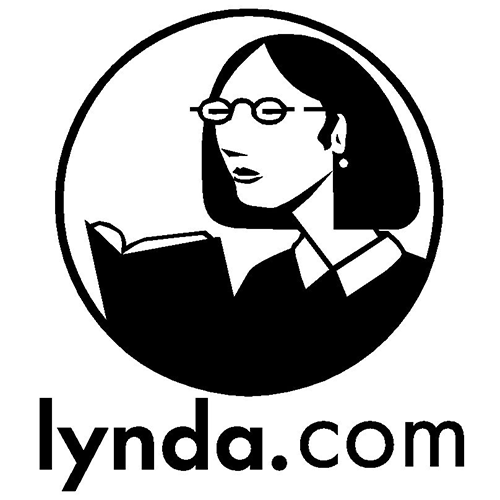 Lynda.com, an online training video library is now available for free to all DePaul students, faculty, and staff. 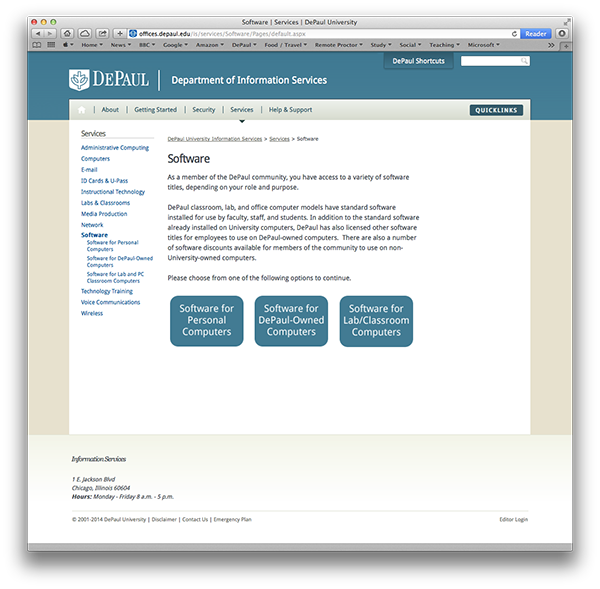 For more information about the courses available or to create your free account, visit software.depaul.edu/lynda. For more information, please email MPT@depaul.edu. Where can faculty, who may be intimidated by the Adobe resources for creative professionals, get documentation on how to use the Creative Cloud programs? i.e. Where can you get info on the fundamentals? Where can faculty get and see examples of best practice in education using the Creative Cloud programs? Adobe Education Exchange. Membership is free, but needs an Adobe ID. Adobe Education Exchange also has a series of MOOCs (providing a certificate) that train educators in the various tools. This is something I highly recommend. Steve Kelly shared a link to a very interesting website with me. join.me is a screen sharing service for meetings (and lectures) that works on mobile devices as well as desktop computers. 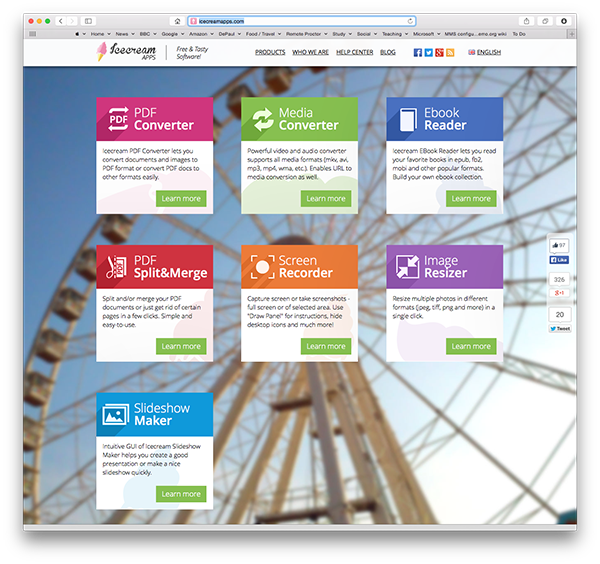 This looks to be a very useful collaborative tool. BigBlueButton is an open source solution that supports sharing of slides (PDF and PPT), video, chat, voice (using Asterisk), and desktops. The support site for BigBlueButton is a little sparse at the moment, but this looks to be an extremely useful (and cheap) way of running a webinar or videoconference.